Managing your product inventory is a key part of controlling costs and keeping customers happy by having popular items in stock. Using the Online Store's inventory feature helps you keep track of everything. Note: This article is for the standalone version of Online Store. It doesn't apply to the Website Builder version. In your Products list, click Online Store, and then click Manage next to the account you want to use. At the top of your screen in the Products tab, click Products. On the All Products page, click the product whose inventory quantity you want to enter. Note: Choosing Allow backorder enables a customer to place an order even if the inventory is down to 0. 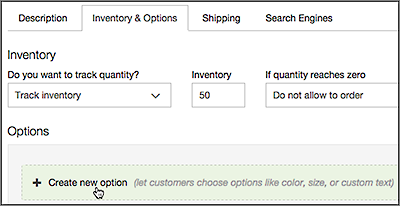 Choosing Do not allow to order triggers an alert on the storefront when the product inventory drops below 3, and prevents the customer from buying the product when inventory reaches 0. Enter how many of that product you have on hand in the Inventory field. 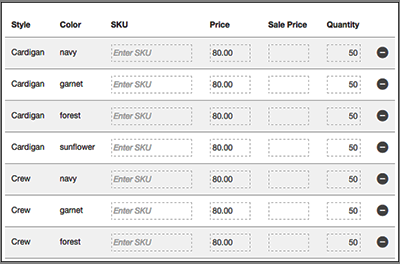 If you have variations of the product, such as sizes or colors, click Create new option in the Options section. To track inventory for an option and its choices, click to toggle the button for Advanced tracking from Off to On. Note: Once you turn on Advanced tracking, the main Inventory field is locked since you need to set inventory quantities for each choice in the Options grid at the bottom of the page. 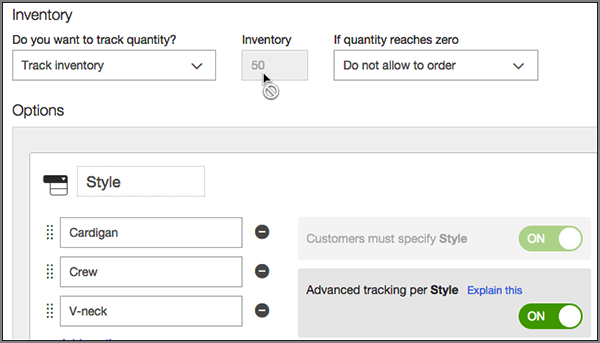 If you turn Advanced tracking back to Off, the quantity field for each choice no longer displays, limiting you to setting only an overall quantity in the single Inventory field. 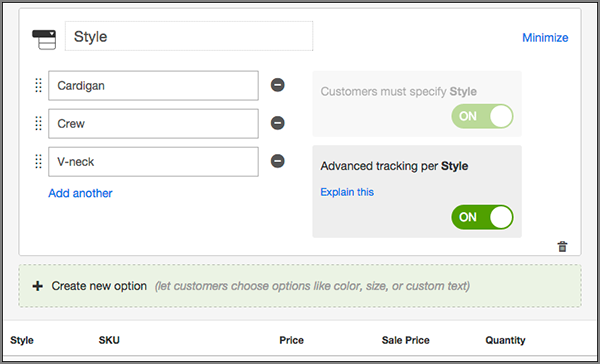 If you turn on advanced tracking, you can use the table below the Options section to edit each choice's SKU, Price, Sale Price or Quantity. Note: Clicking Hide removed items or Show removed options or at the bottom of the table enables you to hide or see all the removed items with a single click. To show them on the storefront, you'll need to click each individual counter-clockwise arrow. Click Save when you're done with that product.